Phobias are a very real thing for over 6.5 million Americans, with the most common phobias being: public speaking, and death.1 Phobias can either be learned, such as from a parent, or can stem from traumatic experiences. They can often appear as simply exaggerated fears. The fact is, phobias are rooted in the subconscious mind, thereby making the root cause of the phobia not obvious, which is why it can be viewed as "seemingly" irrational. However, when using certain hypnotherapy techniques, such as Past Life Regression, you would be amazed what can be uncovered exposing the real root cause of the fear, making it really not so "irrational". In Transpersonal Hypnotherapy, we understand that our subconscious mind also houses all memories of our past lives, as well the experiences of those lives. People with phobias experience real physical and mental fear when exposed to that which triggers the phobia. It is a stress response, which causes the person to freeze up and become immobile. The fear is so "real" to the person experiencing it, that it actually creates the physical response. The subconscious mind is found in our limbic brain. This part of our brain is where the "fight or flight" responses are programmed. Since phobias are rooted in the subconscious mind, we cannot simply attempt to use "logic" or the conscious mind to overcome them. The key is to get to the root of the cause in the subconscious. Hypnotherapy works to open the subconscious mind, making the subconscious thoughts and memories available to the conscious mind. When you start to break down a phobia to it's root cause using some hypnotherapy tools, the unique characteristics to a persons phobia is revealed. For example, someone may present thinking they are afraid of flying, yet after some uncovering hypnotherapy work, one can discover they are actually afraid of small, closed in spaces. 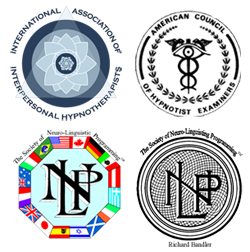 NLP becomes a critical aspect of working with phobias as it is based on the premise that everyone's maps are unique. Your neuro map and your language map are unique to you. Clumping phobias into groups such as claustrophobics, lessens the personal aspect of the work. I've seen some pretty incredible processes when working with clients with phobias. I choose not to use a one-size shoe fits all approach in my practice. The approach I use is customized to you. Depending upon several factors including the type of phobia you describe, your personal belief systems, the limitations the phobia has placed in your life, will all combined determined the best approach I can use to help you overcome your phobia. There are many tools in hypnotherapy and NLP which are very powerful resources that help eliminate phobias entirely. If you are one of those many Americans who's life is challenged with a phobia, I invite you to schedule a complimentary consultation where you can discover and explore how hypnotherapy can help you overcome the phobia permanently.